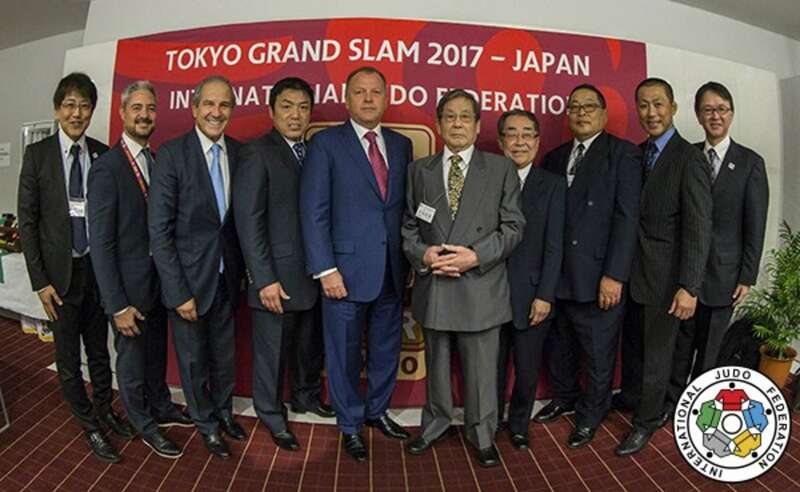 The Tokyo Grand Slam 2017, the fifth and final Grand Slam of the season, featured the world's elite judoka on the opening day as Olympic champions faltered and new stars were born at the Tokyo Metropolitan Gymnasium. Japan's annual Grand Slam major is one of the most famed and desirable prizes in the sport and that was evident on Saturday with either a world or Olympic champion competing in all seven weight categories. This year the penultimate event of the season has switched from a three-day format to two days which means that the home fans are being treated to seven categories per day that are brimming with judo stars including a full roster of champions from the host team. Japan dominated day one from start to finish as they won all seven gold medals available, as the 60 other nations in the competition could not oust the mighty home nation. The judo family paid tribute to two Syrian judoka who were tragically killed while other team members were seriously injured when shelling hit their national training centre in Damascus. The IJF have put a fund in place to support the Syrian Judo Federation and the rebuilding of their dojo and a minute's silence was observed at the Tokyo Metropolitan Gymnasium before the final block. Following the Japanese national anthem and the anthem of the International Judo Federation, Her Imperial Highness Princess Tomohito of Mikasa was introduced to the crowd along with IJF President Mr. Marius VIZER, All Japan Judo Federation President Mr. YAMASHITA Yashuhiro and Kodokan Judo Institute President Mr. UEMURA Haruki. Mr. YAMASHITA Yashuhiro, All Japan Judo Federation President, made the first address in the opening ceremony: "Ladies and gentlemen, on behalf of the organising country, we are honoured by the presence of Her Imperial Highness Princess Tomohito of Mikasa at the Tokyo Grand Slam 2017. We would like to welcome all IJF officials, athletes and everyone from around Japan and from around the world. 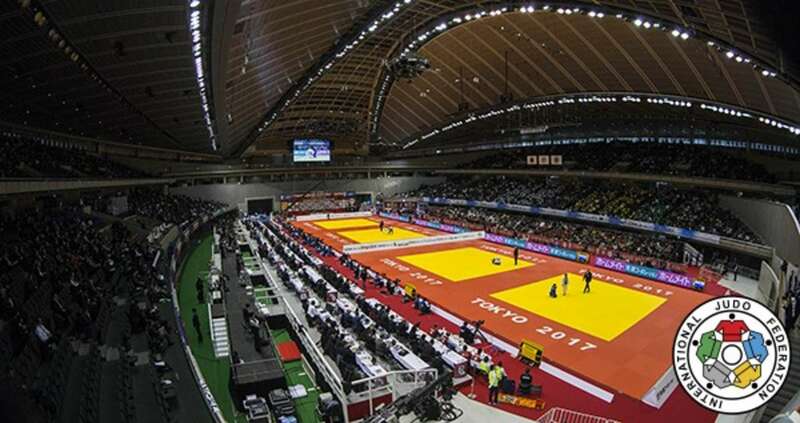 We have the participation of judoka from the World Championships held in Budapest and we expect exciting matches. We are looking forward to dynamic matches between young judoka and veteran athletes and we hope that many of them will be back in Tokyo in 2019 for the World Championships and a year later for the 2020 Olympics. "Judo founder Jigoro KANO devoted his entire life to human education, he had a focus on the development of human beings not only with strength and judo techniques but also with respect, manners and etiquette as humans who serve our societies. Based on these principles we deploy activities of judo in our MIND (Manners, Independence, Nobility, Dignity) project and we hope that this spirit will spread not only in Japan but all over the world through the officials and athletes attending this event. "For judoka taking part in this event, I sincerely hope that you will demonstrate the result of your day-to-day training and will excite judo fans all over the world. Regardless of the results, I hope you will respect the spirit of judo and your opponents. I conclude by extending my heartfelt thanks to everyone involved in the preparation of this Grand Slam, thank you very much." Mr. Marius VIZER, IJF President, said: "Your Imperial Highness, dear President YAMASHITA, dear President UEMURA, dear media representatives, ladies and gentleman, I want to congratulate the AJJF once again for their very successful organisation of the Tokyo Grand Slam, it is very important because in 2019 we organise together the Worlds and in 2020 the judo event in the Olympic Games and for the first time in judo the mixed team event will be in the Tokyo Olympics. "For the success of the team event in the next Olympics, I want to thank all of the judo family and the Japanese judo family, Olympic support, governmental support and the support of the people. I want to thank as well our media partners, Hakuhodo, for our successful cooperation. "Now we honour a special personality from the judo world who has dedicated over 60 years of his life to judo in South Korea, Asia and the world. President KIM is nominated as an Honorary IJF Executive Committee member, as the former President of both the Korean Olympic Committee and the Korean Judo Association. Thank you very much Mr. KIM for all your dedication to judo and your achievements. I declare the Tokyo Grand Slam 2017 open, thank you very much." 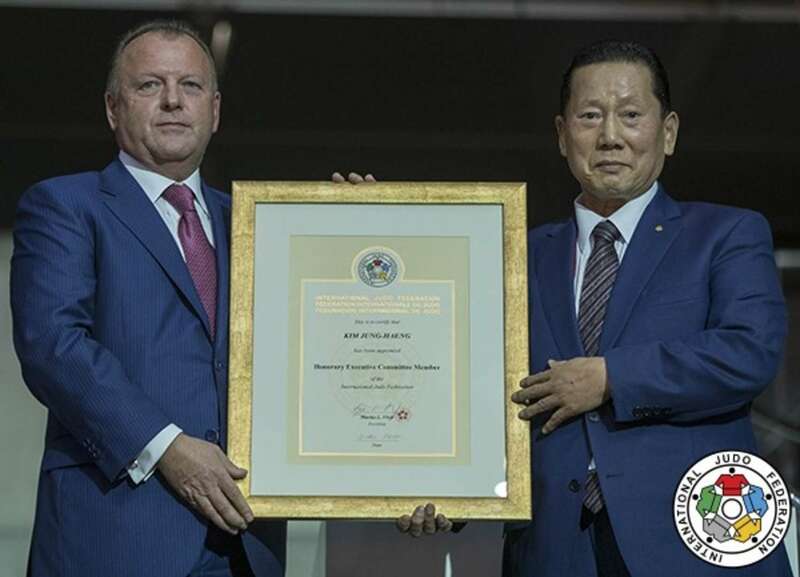 IJF President Mr. Marius VIZER presented an IJF Executive Committee Honorary Membership Diploma to Mr. KIM Jung-Haeng (above - right), former President of both the Korean Olympic Committee and of Korean Judo Association. On Sunday the remaining seven weight categories will be disputed with Olympic champion Lukas KRPALEK (CZE) returning at +100kg while Openweight World Championships winner ASAHINA Sarah (JPN) will wear her new red backpatch for the first time. Jean-Luc Roug is a very busy man and he is not easy to catch as he is the President of the French Judo Federation, Secretary General of the International Judo Federation and among many other missions, he was also the first French World Judo Champion, in 1975. 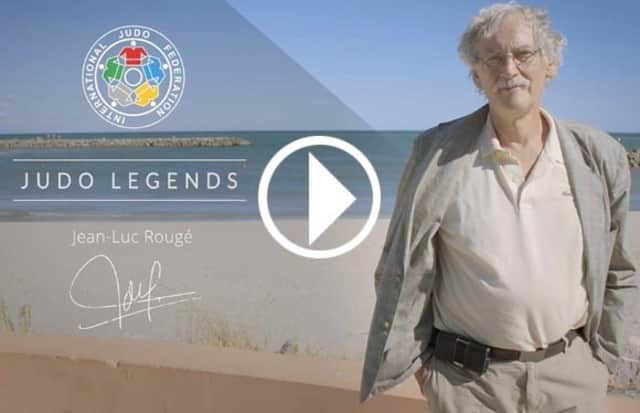 This summer, despite a busy schedule, Mr. Roug gave an exclusive interview to the IJF as part of the JUDO LEGENDS series. On the shores of his childhood's Mediterranean sea, Jean-Luc Roug looked back on his early years in the judo club of the Saclay Atomic Research Centre, on his first national and international titles, but also on his vision of judo in France and in the world, in a context where sport and society constantly evolve. JUDO LEGENDS: The International Judo Federation is pleased to release the sixth episode of its series of films on the legends of judo, who are above all builders of what our sport has become today. Whether they are or have been great champions, referees, or great leaders of world judo... they have all contributed to making judo a major player in international sport. Over the coming weeks, the IJF will keep releasing more videos of these exclusive interviews and will unveil the messages that these personalities have to offer us. Olympic and world bronze medallist KONDO Ami (JPN) started Japan's gold medal rush by winning the first final on day one of the Tokyo Grand Slam 2017. Former world champion KONDO took advantage of a slip by her opponent and world number one MUNKHBAT Urantsetseg (MGL) as the Japanese trapped the Mongolian in osaekomi for 20 seconds in golden score to clinch the -48kg title. In the first semi-final Hohhot Grand Prix winner KANG Yujeong (KOR) fell to KONDO. Despite going in front with a waza-ari from a yoko-tomoe-nage KANG could not hold back KONDO who pinned down her opponent in osaekomi for 20 seconds to move into the final. In the second semi-final MUNKHBAT bested former World Judo Masters winner ENDO Hiromi (JPN) by ippon. The first bronze medal contest saw world champion TONAKI Funa (JPN) salvage a place on the podium at the expense of her compatriot ENDO. Japan's -48kg number three ENDO aimed to secure some international assignments in 2018 but lost her position in ne-waza and was held down by a grateful TONAKI who won the hosts' first medal at home. The second bronze medal contest opposed Rio 2016 Olympic silver medallist JEONG Bokyeong (KOR) and teammate KANG and it was the former who prevailed. KANG received her third shido for passivity after three minutes and 15 seconds of golden score. Top seed Otgontsetseg GALBADRAKH (KAZ) was surprisingly humbled in her first contest as she fell by a waza-ari score to KANG in golden score. 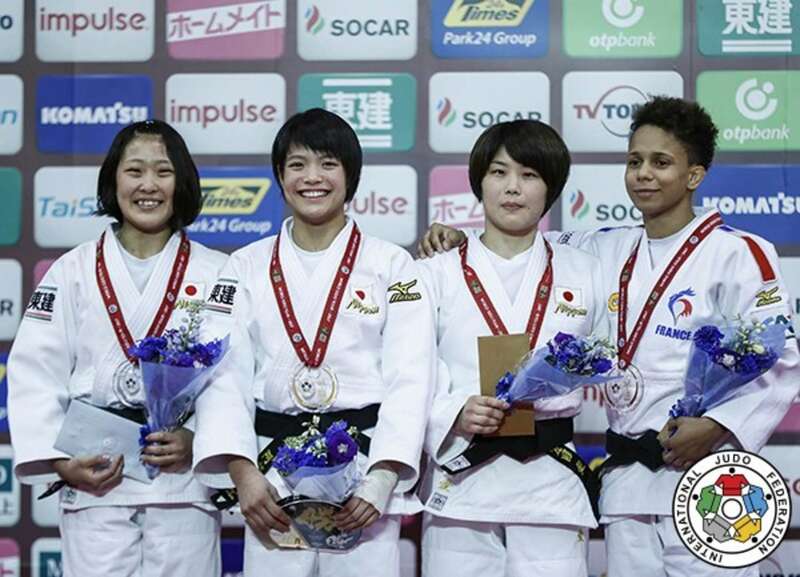 Junior world champion ABE Uta (JPN) won her first Grand Slam gold medal as she improved on her silver medal from a year ago. 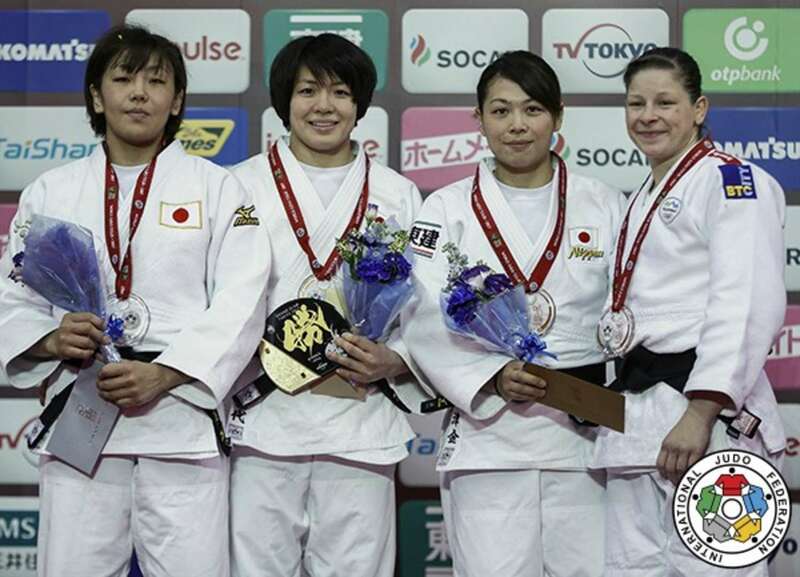 ABE faced Sofia European Open silver medallist TATSUKAWA Rina (JPN) in the -52kg final and emerged triumphant after just 46 seconds with an ippon seoi-nage earning the maximum score as the ABE siblings proved to be unstoppable on home soil. In the first semi-final teenage ace ABE bested Ekaterinburg Grand Slam bronze medallist Amandine BUCHARD (FRA) by two waza-ari scores. In the second semi-final 21-year-old TATSUKAWA held down Abu Dhabi Grand Slam bronze medallist Gili COHEN (ISR) for ippon. The first bronze medal contest saw world champion SHISHIME Ai (JPN) capture a place on the medal podium by pinning down COHEN for ippon with a ruthless display of ne-waza. In the second bronze medal contest BUCHARD recorded one of the most important wins of her career as she conquered Abu Dhabi Grand Slam bronze medallist Alexandra-Larisa FLORIAN (ROU). France's world number 11 was in tears as she left the mat after catching Romania's world number six with an osoto-gari in golden score and is now line to move into the world's top eight in the new IJF World Ranking List next week. 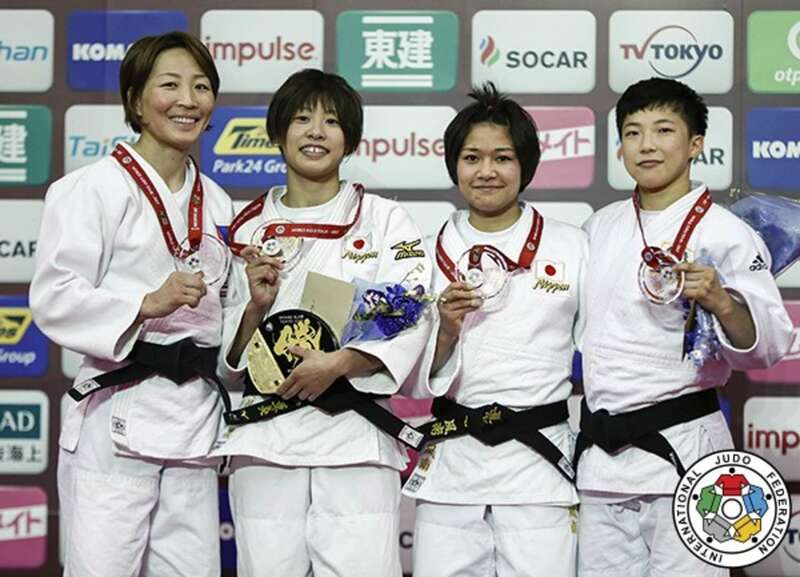 World silver medallist YOSHIDA Tsukasa (JPN) led an all-Japanese quartet onto the -57kg medal podium as Japan kept all four medals in judo's founding country. 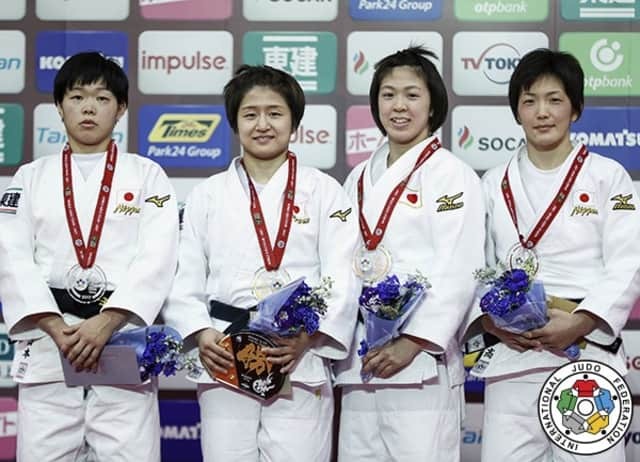 YOSHIDA defeated six-time Grand Slam medallist YAMAMOTO Anzu (JPN) in the -57kg final in a battle attrition with both judoka having two shido penalties to their names going into golden score. In golden score YAMAMOTO momentarily lost concentration and YOSHIDA did not need any invitation to launch for ippon seoi-nage and one of the best ippons of the final block. 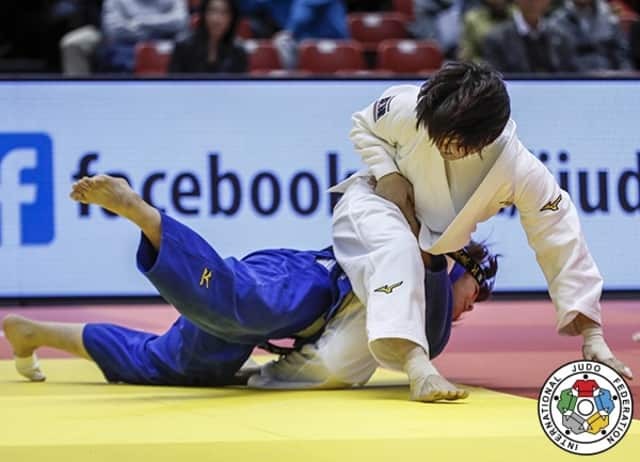 In the first semi-final YOSHIDA squeezed past KARAKAS Hedvig (HUN) by a waza-ari to book her place in the final. In the second semi-final Asian Championships bronze medallist and world number 10 LIEN Chen-ling (TPE) lost out to YAMAMOTO by ippon. In the first bronze medal contest LIEN was caught off guard on the ground and former Junior world champion TAMAOKI Momo (JPN) took full advantage with a yoko-shiho-gatame for ippon. The second bronze medal contest saw former world champion UDAKA Nae (JPN) beat KARAKAS with one minute left by ippon with a ashi-guruma. Olympic champion Rafaela SILVA (BRA) was unceremoniously dispatched in the opening -57kg round by LKHAGVATOGOO Enkhriilen (MGL) after receiving three shido penalties. Double world bronze medallist TASHIRO Miku (JPN) put her disappointment of being left out of her country's team for the Suzuki World Championships 2017 by confirming her place as not only Japan's number one judoka at -63kg but also as one of the top judoka at this weight in the world. Hohhot Grand Prix winner TASHIRO won her first Grand Slam gold medal at an important time, as a younger generation have been a rich source of medals for Japan since Rio 2016.Asian Championships winner NABEKURA Nami (JPN) fell behind to a waza-ari score and TASHIRO showed her contest management skills by wisely engaging her younger opponent in ne-waza to use up vital seconds. The first-time Grand Slam victor was one of the most popular of Japan's seven winners on day one and looks poised to return to the World Championships stage in 2018. In the first semi-final Olympic champion and European champion Tina TRSTENJAK (SLO) tumbled to TASHIRO who took the lead with a o-uchi-gari and followed up with a yoko-shiho-gatame hold for ippon. In the second semi-final NABEKURA trapped The Hague Grand Prix winner Juul FRANSSEN (NED) on the ground for ippon. In the first bronze medal contest 2012 Tokyo Grand Slam winner TSUGANE Megumi (JPN) produced the only score of her content with FRANSSEN as a waza-ari was the difference after four minutes. The second bronze medal contest saw TRSTENJAK come through a tough contest against 22-year-old IJF World Judo Tour debutant DOI Masako (JPN). DOI was penalised for passivity with seven seconds left, her third penalty of the contest, to receive hansoku-make. 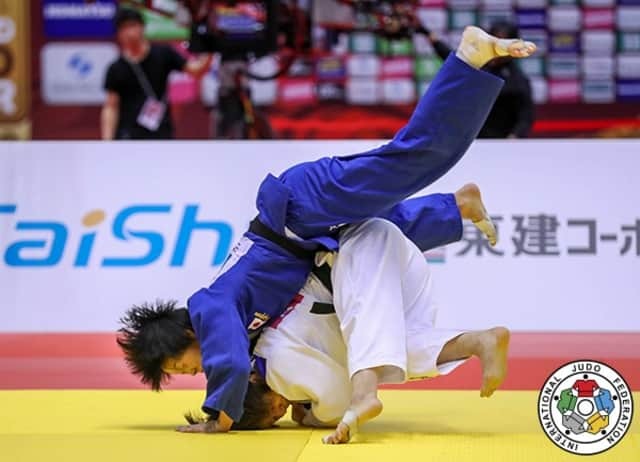 Two-time and reigning world champion TAKATO Naohisa (JPN) won the -60kg title to celebrate an eighth Grand Slam gold medal and to extend his winning streak to 18 contests. TAKATO faced former world silver medallist DASHDAVAA Amartuvshin (MGL) in the final and both judoka were tentative as they accumulated two shidos apiece in regulation time. TAKATO needed 56 seconds of golden score to seal victory when he took control of his opponent with te-waza and the in-form Mongolian was beaten by ippon as Japan's men's team were off and running in the final Grand Slam of 2017. In the first semi-final TAKATO defeated defending Tokyo Grand Slam champion NAGAYAMA Ryuju (JPN) by a waza-ari score to avenge his loss at the hands of his Tokai University teammate from a year ago. Former world silver medallist Rustam IBRAYEV (KAZ) lost out to fellow Worlds runner-up DASHDAVAA in golden score. A second shido for the Kazakh separated the Asian rivals in added time to send DASHDAVAA into the gold medal contest. The first bronze medal contest was won by two-time Grand Slam winner SHISHIME Toru (JPN) who defeated IBRAYEV by a waza-ari which came after only 15 seconds from an o-uchi-gari. 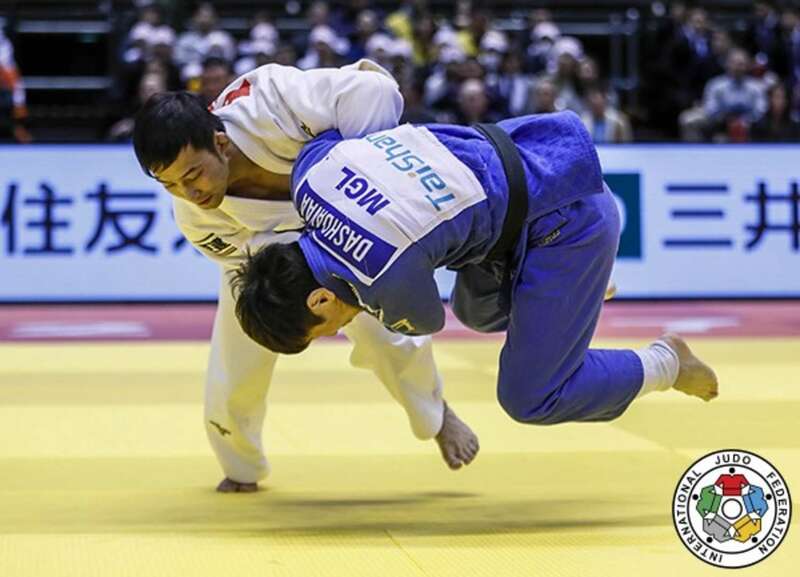 The second bronze medal contest saw 2016 Tokyo Grand Slam bronze medallist CHOI In Hyuk (KOR) lose in the last 30 seconds to NAGAYAMA. 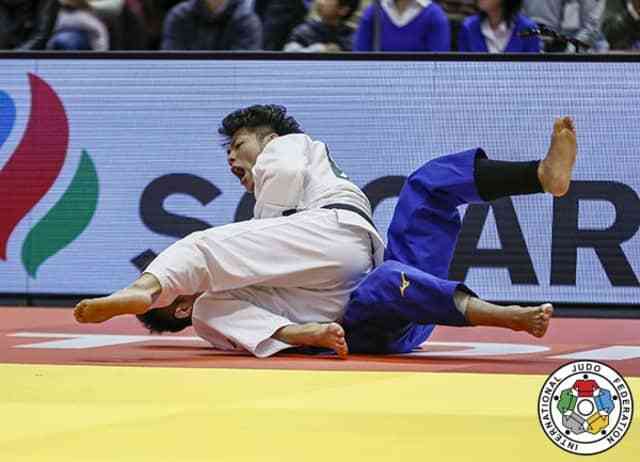 Japan's defending champion threw CHOI with an ippon seoi-nage for the maximum score to the delight of the home crowd. World champion ABE Hifumi (JPN) has now won 28 consecutive contests after winning four of his five contests by ippon today. 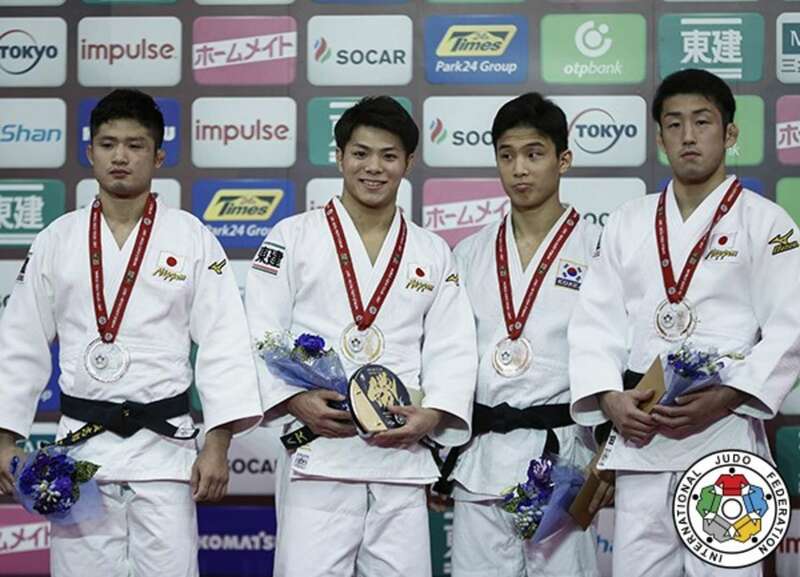 ABE, who had already seen his younger sister ABE Uta win -52kg gold, fulfilled his part by defeating a game Joshiro MARUYAMA (JPN) who was appearing in his first Grand Slam final. 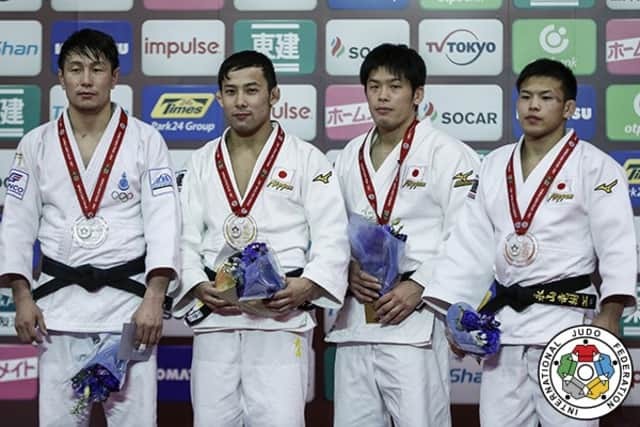 Former Almaty Grand Prix winner MARUYAMA, 24, of Tenri University, worked hard to force the contest in golden score but ABE always keeps something in reserve and threw his compatriot after 52 seconds of additional time with an o-uchi-gari to win his fifth Grand Slam gold medal at only 20 years of age. The ABE siblings would actually be second in the medal table on their own after their day one exploits. Both youngsters appear destined for a major impact on the Tokyo 2020 Olympics and are two of the new faces of the IJF World Judo Tour in this Olympic cycle. 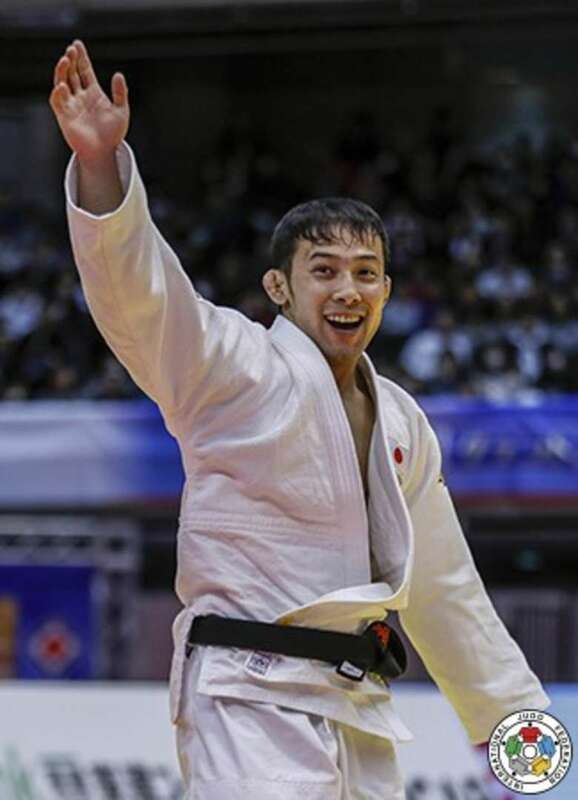 In the first semi-final Dsseldorf Grand Prix silver medallist ISODA Norihito (JPN) gave world champion ABE a difficult contest but the latter eventually prevailed by ippon after two minutes of golden score. In the second semi-final Rio 2016 Olympic silver medallist AN Baul (KOR) narrowly lost out to MARUYAMA in golden score by a waza-ari. In the first bronze medal contest AN was on top form as he convincingly brushed aside Antalya Grand Prix bronze medallist Baruch SHMAILOV (ISR). AN led with a waza-ari from a ippon seoi-nage and then countered a weak osoto-gari for ippon. The second bronze medal went to ISODA who surged past Vazha MARGVELASHVILI (GEO) after just 13 seconds with a foot sweep. 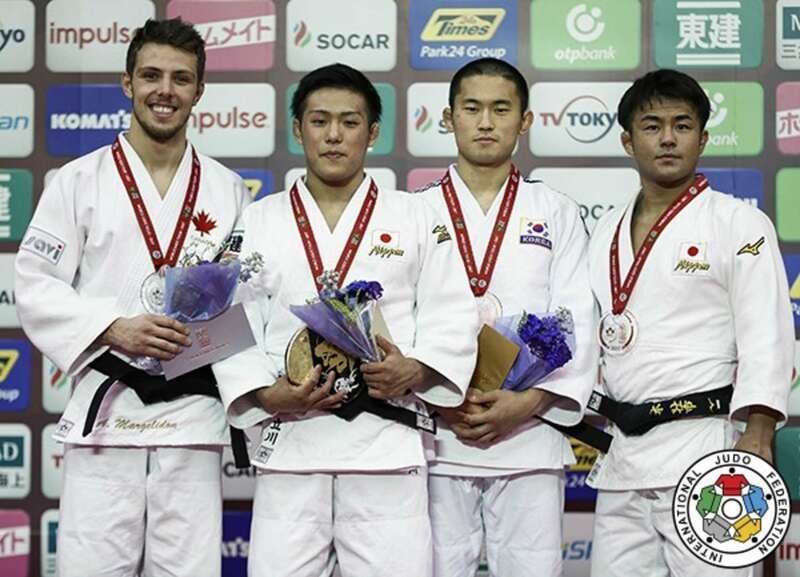 Asian Championships bronze medallist TATSUKAWA Arata (JPN) was an unexpected winner of the -73kg category as he overcame a fellow surprise finalist in Hohhot Grand Prix silver medallist Arthur MARGELIDON (CAN). Japan was always expected to be triumphant in this category having won the world title at this wait every year since 2010 but the source of the gold medal was one of the biggest shocks of the 2017 season. Talk of a possible dream clash between world champion HASHIMOTO Soichi (JPN) and returning Olympic champion ONO Shohei (JPN) attracted almost all of the attention in the build-up to the event but proved to be premature. TATSUKAWA was engaged in Grand Slam final action by MARGELIDON who broke new territory with a career-making performance in the home of judo. There was nothing to separate the finalists going into golden score as both men were cautious and wary of the form of each other from the preliminaries. MARGELIDON was penalised for a second time in golden score for ducking underneath the gripping attempts of the Japanese judoka who took the spoils and his first gold medal on the IJF World Judo Tour. In the first semi-final world champion HASHIMOTO Soichi (JPN) was stunned by TATSUKAWA in golden score when the former was penalised with a third shido for passivity. In the second semi-final MARGELIDON pipped NOGAMI Rentaro (JPN) by a waza-ari to already guarantee the best result of his career. The first bronze medal was won by 20-year-old AHN Joonsung (KOR) who opened his IJF World Judo Tour medal account when NOGAMI picked up a third shido in golden score for passivity. The second and last male bronze medal contest was won by HASHIMOTO who threw world bronze medallist GANBAATAR Odbayar (MGL) with a seoi-otoshi on the edge of the area for ippon after two minutes of golden score. Olympic champion ONO Shohei (JPN) was forced to withdraw from the competition due to a knee injury. In his first competition since Rio 2016, ONO defeated Bektur RYSMAMBETOV (KGZ) on shidos in golden score in his only contest but afterwards pulled out and was a forlorn figure at the Tokyo Metropolitan Gymnasium.